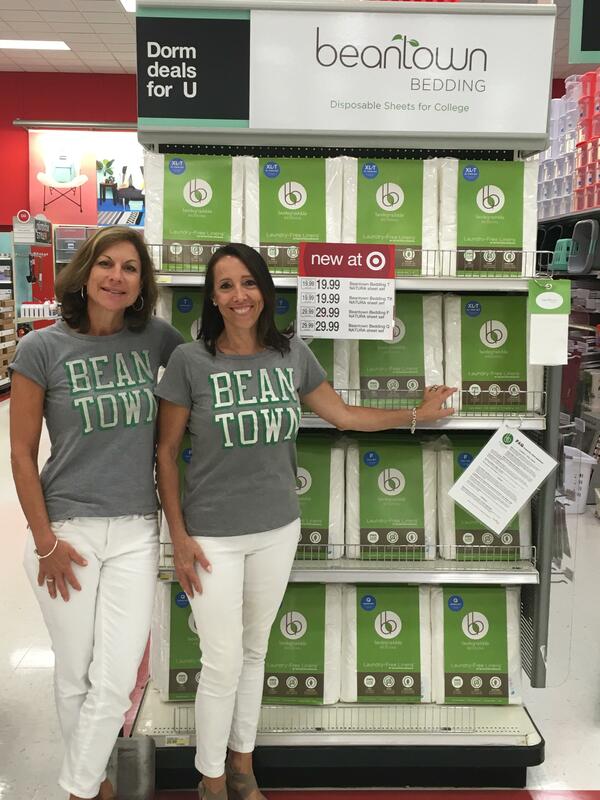 “Since we developed Beantown Bedding specifically for busy college kids, we’re particularly thrilled to be a part of Target’s Back to College collection,” said Kirsten Lambert, CEO and Co-Founder of Beantown Bedding. “College kids juggle a lot of things over the course of a semester, and have to choose between spending time in the laundry room or sleeping in dirty sheets.” Laundry-Free Linens® can be used for weeks and are disposable, so students can have clean sheets without wasting time on laundry. While convenience is clearly the key benefit, what makes the sheets truly innovative is that they’re both comfortable and compostable. Made with TENCEL®, an award winning eco friendly fiber from Eucalyptus, they’re hypoallergenic, USDA 100% Biobased and compostable; returning to nature in as little as two weeks. According to the American Academy of Allergy, Asthma and Immunology, “Dorm life breeds mold, dust mites, bacteria and viruses.” Beantown Bedding Co-Founder Joan Ripple adds, “It’s no wonder college kids get sick and suffer from allergies. As mothers ourselves, we were concerned about their health and decided to come up with a solution.” As it turns out, Beantown Bedding’s “solution” has caught on well beyond the college campus. The company’s wholesale business is changing the way linens are handled in the travel and hospitality industry, offering a more efficient and sustainable alternative for conference centers, university housing, camps and Airbnbs across the country. In 2015, the company was chosen to provide bedding for the Special Olympics World Games in Los Angeles. While Beantown Bedding’s innovative sheets are available online, this week marks the company’s first foray into Target stores, including five in the Boston area: Fenway, Framingham, South Bay, Somerville and Watertown.